This month's challenge was to use embroidery floss in a fun way, go here to see all of the hoppers and play along! Thank you so much for visiting! Please leave a comment and let me know what you think!! Very pretty! Love the vintage look of your card! The bird's nest made with the embroidery floss is so fantastic. Gives it great texture and realism. Love it! Love the soft, vintage colors and feel! Gorgeous! I love this, the bird is so lovely! And the colors in your card are amazing, wonderful card!!! I love this with the burlap. I just love the little nest on the branch. Such soft and pretty colors you used too. Great idea to use the floss for the bird's nest! Love that bird's nest and the burlap behind the mat is perfect! adorable! love the burlap and stitched nest! OH MY, What a super, super sweet card! Love the soft colors and all the beautiful details! BEAUTIFUL!!! What a gorgeous card!!! Great job! I especially like the nest.Very clever. That bird nest is fabulous! This card is exquisite! It has a gentle softness about it that compliments the bird, nest and egg. Beautiful composition, beautiful stitching!! Amazing use of so many stamps and layering of elements. the rustic burlap and the soft colours of the nest/egg and flowers/leaves is very appealing. I love this! The stitching around the mat stack die is beautiful, and the stitched nest couldn't be any cuter! Pretty! I like that little bird's nest, so sweet! Oh, wow! This is awesome. Love the stitched nest! Your card is so gorgeous! How neat! Love all that die cut burlap, too! Gorgeous! Love the soft colours and the image you created inside the frame. Oh my, that nest is just perfect! What a great card! So very creative, Becky! 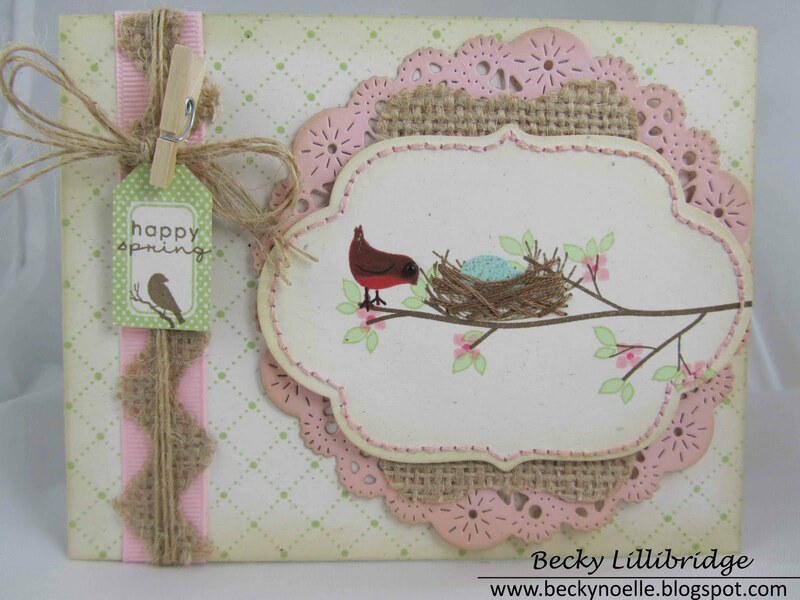 Love the bird nest and the pretty pastel colors you used. The burlap and lacy doily are fabulous together! OMG, I LOVE the nest! The speckled egg and twine make it seem so real and I love how your little bird looks like a robin! Wonderful colors and design!! Love the texture created by the burlap and the inventive way you made the bird's nest. So soft and pretty! Lots of great details on this one! I LOVE this card...what a wonderful idea for the floss...so pretty and Spring like...stunning piece of "art"!! Wow, what a fabulous card. Stunning. So pretty! I love the soft pink with the light brown colors together. What a sweet creation! Love the nest in floss- I've used brown twine for a nest too- similar effect & so fun! your stitched border is pure sweetness! So cute! Love the pastel tones! I love this card!! So many wonderful elements, textures, and lovely colors. Loved the stitching also. You are a very talented artist! Beautiful card. Sweet little embroidered nest and great stitched outline. So neat and precise! Can you believe that I'm still making the rounds of the blog hop?! Your card is so impressive; everything about it works. The colors, burlap, used of embroidery, clothespin attached tag, and bird scene come together in a wonderful design. Fabulous.